So openCL in QC would mean fast c-Array stuff like has been speculated about on these threads as a matter of course? Or will Kineme have to make custom patches? Either way it's exciting to see it confirmed with the wall and v cool if that's being driven with iterators, whoo. I can't really get into that. if you have an iphone developers certificate you can check some openAL code out, it is similar 2 openCL. i think the openAL example is os 2 ? not sure but os 3 is GM so i think the non disclosure confidentiality stuff is lifted for openAL ? i don't know i can't keep up with what is ok to talk about or not. i just assume all beta apple stuff has an NDA and its ok for developers to talk about. sort of what happens in fight club stays in fight club kind of moto. seeing that there are a lot of kineme heads here that work for apple im pretty sure chris does not want to connect any dots. pretty sure openCL will be open soon, so if you know openGL you'll probably fit right in. the hint i will give in reference to kineme stuff and SL is take out your GLSL plugin it will cause problems. OpenAL's been open for probably half a decade - http://openal.org/ I remember poking at it briefly way back when I was in college (and an idealistic linux coder). OpenCL's been open for months -- people don't seem to notice this, but it's not been a secret for at least half a year. http://www.khronos.org/opencl/ I read the spec in January, and it was available a little before that. 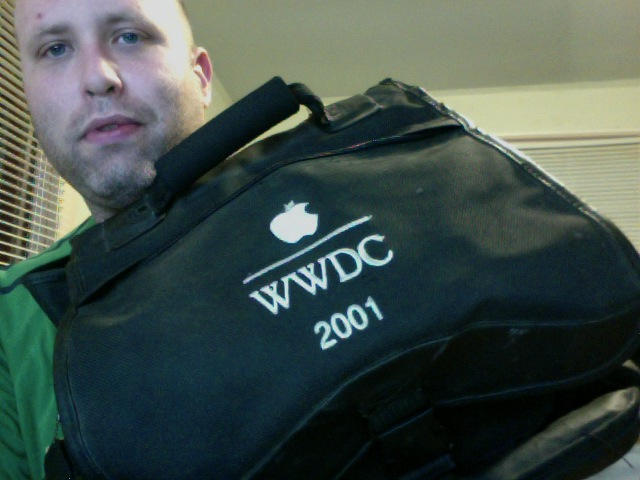 don't feel bad about not being a wwdc this year chris have a look at the attached pic, then feel bad for me cause its been almost a decade for me. your rockin right now apples put you up as top choice on apple downloads for qc builder i think. would have thought you would be there this year for some reason. i don't blame you for not going though, its is a bit pricy. im a college student now so its to pricy for me. they send some kids from my school to wwdc as part of the new media program. im interdisciplinary so i don't really belong to the new media department but they are the apple people. im pushing towards the the spatial side of things more in particular oracle spatial which is composed of all graduates from the university i go to. it seems like thats my best shot at working for the software industry seeing my aunt is oracles politician. someday i might release an app of my own ? not sure why oracle needs a politician to lobby for them but must have something to do with those government agency that don't exist ?? im about to try the seed 10a380. i have tried a few of them, it seems the progression of QC actually did change a bit from seed to seed. but yeah defiantly some driver issues and what not. nothing related to qc but lets say saving tablet preferences and stuff was buggin me with SL, the little things like that and every time you open QC it asks for the k3d plug in key. i suppose collada changes k3d but i bought k3d so im still going to use it when i can. i haven't tried any of the openCL stuff yet just messed with the mesh template but what ever changes where made in snow leopard makes it run like a chetah. i know the cool QC improvements can only run on my geforce but on my gma 950 card things that would run at 10 frames/second now run at like 200 frames/second ! which blew my mind i was expecting a little boost but its massive. yeah openAL i guess has been in the gaming world for a bit. i never messed with it till the iphone but has some wicked spatial panning and orientation etc... im looking forward to teaching myself both AL and CL. anywho take a look at the pic i just took hope it makes you feel better about missing wwdc.